This unusual photograph from the archives is of the 1911 Delhi Durbar Heralds together with the trumpeters who accompanied the heralds. The 1911 Delhi Durbar Heralds and Trumpeters. 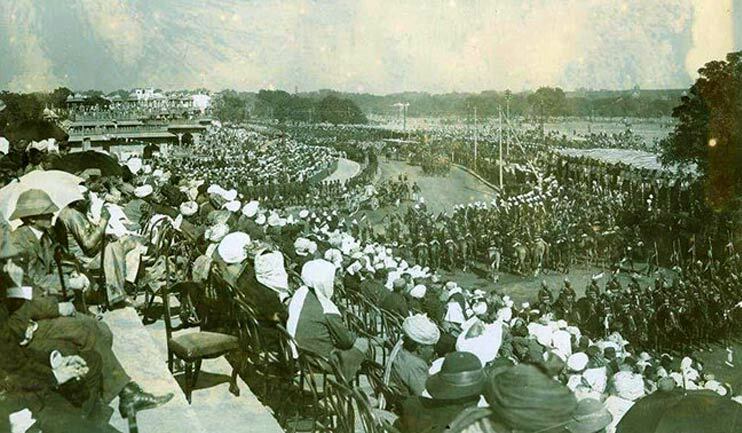 The 1911 Delhi Durbar was held to commemorate the coronation in Britain of King George V and Queen Mary. It was intended to be a grand affair at which their Majesties would be proclaimed Emperor and Empress of India. And a grand affair it was, with official ceremonies lasting from 7 to 16 December. The central event, the Durbar and proclamation, took place on 12 December. Two heralds with ceremonial duties were appointed for the Durbar. 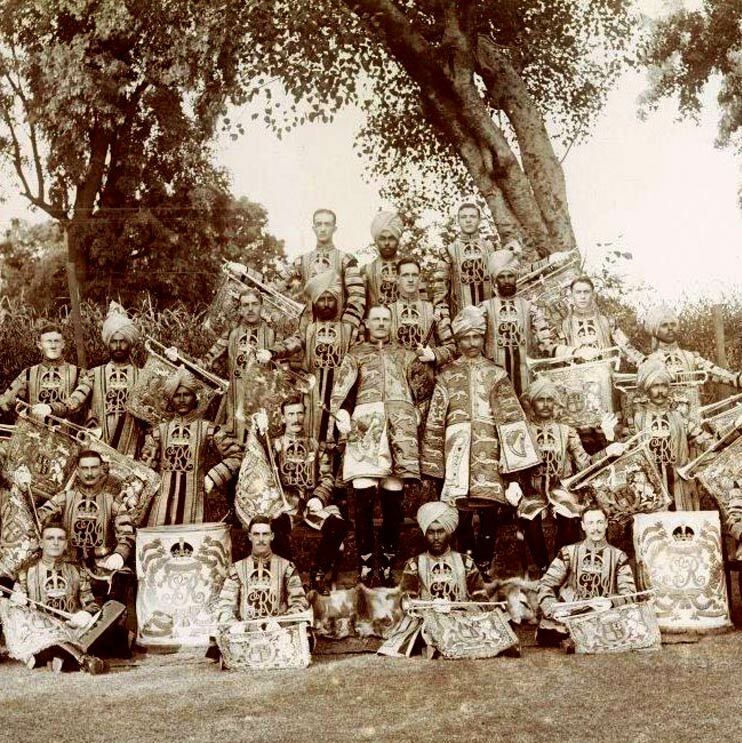 The Delhi Herald of Arms Extraordinary, seen in the centre of this month’s photograph, was Brigadier-General William Peyton (later General Sir William Peyton KCB KVCO DSO), Commander of the Meerut Cavalry Brigade and a former commanding officer of the 15th Hussars. 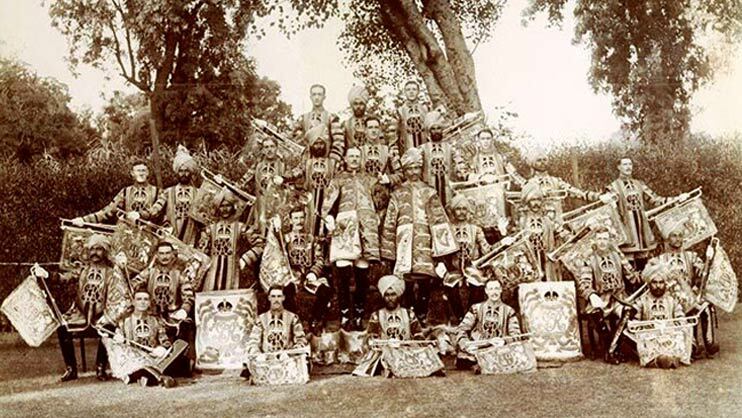 The Assistant Delhi Herald, to his right in the photograph, was Captain the Honourable Malik Umar Hayat Khan of the 18th King George’s Own Lancers. On 12 December Brigadier-General Peyton read out the Royal Proclamation in English and Captain Hayat Khan repeated it in Urdu. Where the trumpeters came from is not absolutely certain. Almost certainly they were found from among the best trumpeters in both the British and Indian army bands in the Presidency of Bengal at the time. It is, for example, known that a massed bands’ camp was formed in October and that the 40-strong Band of the 4th Battalion, The King’s Royal Rifle Corps, was present. Both the 3rd Battalion KRRC, stationed at Dagshai, and the 4th Battalion, stationed at Meerut, provided extensive guards of honour for the Durbar, members of each battalion receiving the 1911 Delhi Durbar medal. The 1st Battalion, The Oxfordshire and Buckinghamshire Light Infantry (43rd), stationed at Wellington in the Presidency of Madras, was not called upon to take part in the Durbar. The 2nd Battalion, The Rifle Brigade, stationed in Calcutta, provided a guard of honour for their Majesties departure from Calcutta to England in January 1912 but was not present at the Durbar.